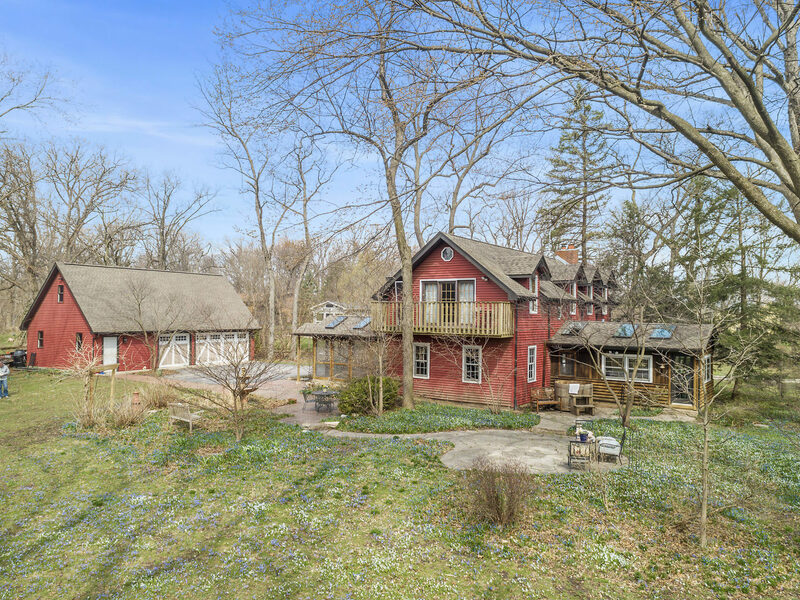 Gorgeous home on INCREDIBLE 2.6 acre-horse-lake rights-gated property, fully fenced!Boat/Skate/Fish aerated Lake.4 car wide garage w/960 sf on 2nd floor wired w/220 for car enthusiast/ hobby/horse. 4 bedroom 2 bath Rebuilt foundation up. Miles of Hardwood. Craftsman Millwork. OaK&6 panel drs. LR HAS: Beamed ceil & wb fireplace.DR HAS: Beamed ceil, built-ins. &apos;18 UPDTD KITCHEN HAS: Granite, cherry cab, travertine. All SS appliances. 2 UPDTD BATHS HAVE: 2nd fl w/whirlpool tub, sep shower, hardwood. 1st fl w/claw tub,hardwood. FR HAS:Vaulted & beamed ceil, skylights, dr to brick patio & Ofuro hot tub. PORCH HAS: Vaulted ceilings,skylights, slate floors, ceiling fan. MASTER HAS: Vaulted ceilings, balcony. wall of windows. 1st flr Bedroom for inlaw. Under 10 years: Siding, roof, plumbing, electric, drain tile, sump pump, driveway,tiered landscape,brick patios & More. Country living yet 4 minutes to Metra.LARGE closet above basement could be Laundry.NEXT TO PRAIRIE PATH! BASEMENT SIZE OF LR!